Everyone knows that feeling when your team suffers an absolutely brutal loss. As part of NFL Worst Week, we break down the biggest gut-punch losses for NFC franchises. When it comes to the worst loss suffered by a team, there's not just one deciding factor. Occasionally, a blowout will determine the game a team's fans talk about with the most regret, but more often than not, it's the close ones that stick to your soul in all the wrong ways. As part of NFL Worst Week, here are our picks for the worst gut-punch loss for every NFC franchise (and here are the worst losses for every AFC franchise). Tossed this one out to the Twitterverse and the vote was well split. Dez Bryant's catch-that-wasn't vs. Green Bay in last year's playoffs remains fresh in the memory banks, while Tony Romo's fumbled snap on a chip-shot field goal vs. Seattle also stands worthy of consideration. And then there is Jackie Smith's infamous Super Bowl XIII drop—the NFL's version of Bill Buckner letting a grounder roll through his legs. But the '82 title-game loss to San Francisco produced its own iconic moment: "The Catch" by 49ers receiver Dwight Clark, on a pass from Joe Montana. Dallas was less than a minute from capturing the NFC and heading to its fourth Super Bowl in seven seasons when Montana found Clark streaking across the back of the end zone. San Francisco went on to win the game, 28–27, launching its 1980s dynasty. Nothing fires up sports fans quite like a blown call, and this game featured a doozy. Before that occurred, though, the Giants first had to cough away a 38–14 lead to Jeff Garcia, Terrell Owens and the 49ers. New York still had a shot to win it late when Matt Bryant lined up for a last-second field goal, but instead a botched snap led to one of the NFL's most controversial moments ever. Holder Matt Allen corralled the low snap and rolled right, then heaved a pass downfield to lineman Rich Seubert, who had reported as an eligible receiver. Seubert was tackled by San Francisco's Chike Okeafor before he could attempt a catch. Flags flew ... for an incorrect call of an ineligible man downfield, not pass interference. The league later apologized for its officials' gaffe—hardly consolation for the heartbroken Giants. Sometimes, an entire game delivers a long, drawn-out 'gut punch'. Such was the case in the 2002 season's NFC championship for the Eagles. They were in front of a rabid home crowd, hosting a Tampa Bay team they had beaten during the regular season, with wind chills dipping below 20. What could go wrong? Well, after Philadelphia grabbed an early 7–0 lead, pretty much everything. The Bucs scored 27 of the game's final 30 points, capped by Ronde Barber's 92-yard interception return for a touchdown off Donovan McNabb. To make matters worse, Tampa Bay then rolled to a 48–21 victory against the Raiders in Super Bowl XXXVII. This game stands out mostly for the tragic circumstances surrounding it. The matchup came mere days after Sean Taylor was murdered during an armed robbery attempt at his home. Washington, under coach Joe Gibbs, opened this game with just 10 defenders on the field as a tribute to its fallen teammate. It was an emotional, painful afternoon at a rainy FedEx Field. Then came the ending. Gibbs called timeout to ice Buffalo kicker Rian Lindell before a game-winning, 51-yard FG attempt. He then signaled for a second consecutive timeout, an illegal ploy that drew a 15-yard penalty. Lindell hit the ensuing 36-yarder. Losing to the Packers always stings for Bears fans. Losing to the Packers at home, in Week 17, with the division title on the line ... yikes. Chicago had Green Bay on the ropes when Aaron Rodgers, just back from a broken collarbone, found Randall Cobb for a 48-yard touchdown on a 4th-and-8 with 38 seconds left. A Sam Shields interception at the buzzer cemented Green Bay's win, bouncing the Bears from the playoffs and robbing them of an NFC North crown. Perhaps no loss in NFL history has swung the fortunes of a franchise as much as Detroit's Week 17 setback vs. Chicago on Dec. 24, 2000. That last-second defeat eliminated the Lions from the playoffs and they would then average 3.9 wins over the next 10 seasons. Still, it's tough to vouch for that setback over last season's controversial playoff loss. The Lions held a 20-17 lead about midway through the fourth quarter when TE Brandon Pettigrew appeared to draw a crucial pass-interference penalty on 3rd-and-1. However, the officials changed their minds and picked up the flag. Sam Martin then shanked a 10-yard punt, leading to a game-winning touchdown drive from Tony Romo and the Cowboys. It's six months later, and the ending to this game remains surreal. The Packers all but had their bags packed for Super Bowl XLIX, up 19–7 and having picked off Russell Wilson with five minutes left. From there, just about everything that could go wrong, did. The Seahawks forced a punt, then scored a touchdown, recovered an onside kick and scored again (complete with a ridiculous two-point conversion), all within a span of 2:19. 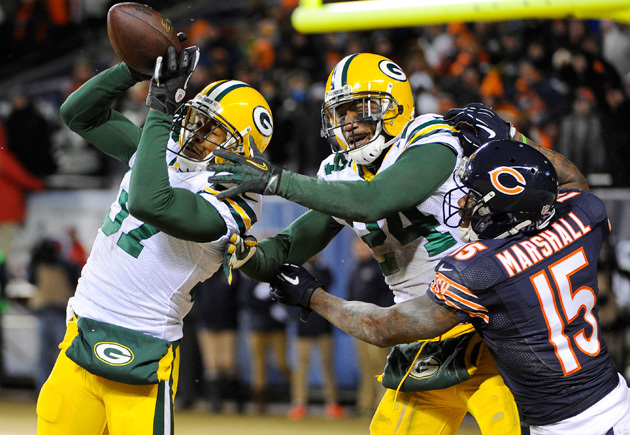 The onside kick was the killer—Brandon Bostick went up for the ball, blocking it from the sure-handed Jordy Nelson. The Packers forced overtime with their own clutch drive late, but a Wilson-to-Kearse touchdown ended the festivities. "And Anderson hasn't missed in two years," famed play-by-play man Pat Summerall noted as the Vikings' Gary Anderson lined up for a 39-yard field goal that would have put his team ahead by 10, with a little more than two minutes to play. "So that's a pretty good bet," John Madden replied. "If you say, 'Do you think Gary Anderson will make this field goal?' The answer's probably yes." Jinxes being what they are, Anderson pulled the kick right, leaving Minnesota's lead at a precarious 27–20. Atlanta's Chris Chandler hit Terrance Mathis to tie the game moments later, allowing Morten Andersen to win it for the Falcons in overtime. The loss was just the Vikings' second of the season. The Falcons still have not recovered from their 28–24 loss to San Francisco in the NFC championship three seasons ago. They let a 10-point halftime lead (and 17–0 second-quarter edge) slip away and had a 4th-and-4 from the San Francisco 10 fall incomplete in the closing moments. But whereas the 49ers started their comeback early, the Falcons had Dallas on the brink deep into the fourth quarter during the 1980 divisional round—Atlanta led 24–10 to start the frame and later 27–17, after giving up a one-yard touchdown run from Robert Newhouse, but answering with a 34-yard field goal from Tim Mazzetti. QB Danny White and WR Drew Pearson brought the 'Boys back, with Pearson's second touchdown catch coming in the final minute to send the Falcons to a crushing loss. The Panthers' first (and thus far, only) trip to the Super Bowl produced an unforgettable game ... no matter how much Carolina fans might try to block the ending from their memories. The upstart Panthers—after knocking off Dallas, St. Louis (in overtime) and Philadelphia to reach the Super Bowl—had the Patriots on the ropes. Carolina took its first lead in a back-and-forth affair when Jake Delhomme hit Muhsin Muhammed for an 85-yard, fourth-quarter touchdown. After the Patriots answered back, a Delhomme-to-Ricky Proehl strike tied it with 1:08 left. That was too much time for Carolina's defense to withstand. Tom Brady marched New England into field-goal range and Adam Vinatieri nailed a 41-yarder for the win. The lesson we seem to be learning is that you don't want to play at San Francisco in the playoffs. Behind a potent offense the Saints stormed all the way back from a 17–0 deficit to take a pair of fourth-quarter leads (24–23 and 32–29). The latter came via a 66-yard pass from Drew Brees to Jimmy Graham with just 1:37 left. But the Saints' defense buckled—a 47-yard Vernon Davis reception pushed the 49ers into the red zone, and Alex Smith then hit Davis on a 14-yard touchdown, giving San Francisco the victory. A decade before fans became familiar with what's now known as the "Calvin Johnson Rule," the NFL's apparent inability to clearly define a catch cost Tampa Bay a trip the Super Bowl. In fact, no one (including FOX's broadcast team) even seemed to know why the officials stopped play for a review following Bert Emanuel's 12-yard reception—a catch that moved the Bucs, trailing 11–6 with less than a minute left—to the edge of St. Louis red zone. It came as even more of a surprise when the catch was overturned, pushing Tampa Bay from a 3rd-and-11 back to 3rd-and-23. Two Shaun King incompletions later, the Rams were NFC champions. Driving the dagger deeper for Tampa Bay was its wasted, but brilliant, defensive effort. No team held St. Louis' powerful offense to fewer than 21 points until the Buccaneers slowed them down in this game. Had King not thrown an interception to set up Kurt Warner's go-ahead touchdown pass, the Buccaneers may have escaped with a 6–5 win. 'Tis better to have played in a Super Bowl and lost than never to have played in a Super Bowl at all. Probably. The Cardinals' tale of woe is similar to that of Carolina above—underdog gives the favorite all it can handle, only to come up short. Arizona overcame a 100-yard James Harrison interception return and a 13-point deficit to take a 23-20 lead late in the fourth quarter, thanks to Larry Fitzgerald's 64-yard score. 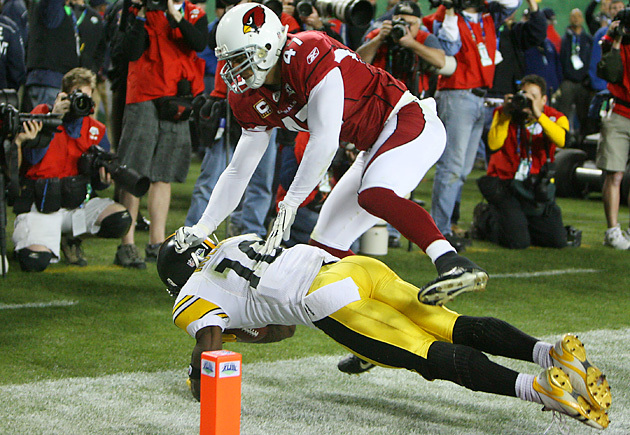 The NFC champs had no answers for Santonio Holmes down the stretch, though. Holmes caught four passes from Ben Roethlisberger for 73 yards on the Steelers' decisive drive, including a tip-toeing touchdown grab at the 42-second mark. When the lights went out at the Superdome, shortly after Jacoby Jones's 108-yard kickoff return had pushed San Francisco into a 22-point hole, Super Bowl XLVII sure felt over. The Ravens' fans in attendance spent the power outage singing the familiar "Seven Nation Army" chorus—an early celebration for their certain coronation. But once the game resumed, the 49ers came storming back. They missed a chance to tie the game at 31 on a failed two-point conversion. Later, in the closing two minutes, Colin Kaepernick fired three straight incompletions from Baltimore's 5-yard line with his team trialing 34–29. Should San Francisco have run it at least once? Maybe. A more pressing question once the outcome was decided: Is it less painful to watch your team get blown out in a big game than to see them fall short after a rally? The play call heard 'round the world. Trailing New England by four with 26 seconds left, and in need of just one yard to win a second consecutive Super Bowl, the Seahawks opted for a pass on 2nd-and-goal. You know the conclusion: Malcolm Butler jumped Ricardo Lockette's route for an interception, arguably the most improbable Super Bowl ending of all time. In addition to Russell Wilson and Marshawn Lynch's running capabilities, the Seahawks also still had a timeout left—they could have run, come up short and still had multiple cracks at the end zone. Seattle fans also will not soon forget that their team's vaunted defense surrendered back-to-back fourth-quarter touchdowns to the Patriots, permanently flipping the scoreboard in New England's favor. What is it with the NFC West and brutal Super Bowl losses? The Rams endured their own version of heartbreak on the game's biggest stage, at the same time helping to launch the legend of Tom Brady. Two years removed from the franchise's first Super Bowl triumph, the Rams' "Greatest Show on Turf" hit such great heights again during the 2001 season that they entered the matchup with New England as whopping 14-point favorites. The anticipated blowout never materialized. The Rams' potent attack mustered just three points in the first three quarters, before rallying with two touchdowns in the fourth (a 2-yard Kurt Warner run and 26-yard Warner-to-Ricky Proehl pass). Brady didn't blink. He completed 5-of-8 passes for 53 yards on New England's final drive, setting up Adam Vinatieri's dramatic 48-yard field goal as time expired. The Patriots have been to five more Super Bowls (and won three) since this classic showdown; the Rams are just 1–2 in the playoffs since their devastating defeat.